Skill building and training is an ongoing part of an employees' regimen at all levels. We offer outstanding development opportunities in a fast-paced, challenging work environment. That means you'll learn from the best, both internally and externally. We look for people with different views, ideas, experiences and backgrounds to bring dynamism to the business and, most importantly, an empathy with each other. It's those individuals working together that make WWIL one of the most preferred wind energy providers in the country. Being in a challenging environment like wind power generation requires teams who are adept at meeting a variety of on-the-job challenges. Be it in finance, liaison, manufacturing, services, marketing, inter-personal arenas, infotech and more. 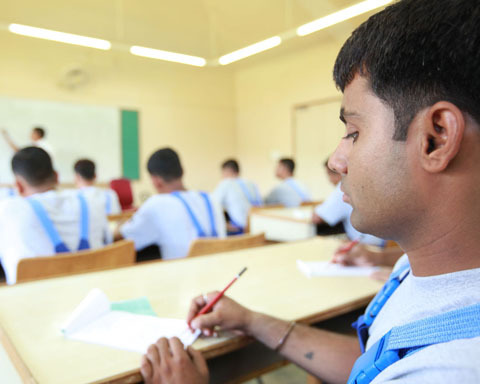 Most of our servicing personnel are rigorously trained at the Wind World Training Academy in Daman. The rest of our people are constantly challenged to enhance their expertise through a variety of job-specific, team building, personal enhancement and growth skills; on-site as well as off-site. The induction program caters to the diverse needs of fresh as well as experienced newcomers to the WWIL family. It extends a platform to new employees interact with the diverse teams and get firsthand information on various business functions, which helps them integrate with the organization and its practices. A feedback process from the time of induction helps both individual and the organization to understand things in the right perspective with better adaptation and expectation mechanisms; this continuously helps individual integration within organization. These programs is designed to give front line employees and technicians an opportunity to seek knowledge and information about organizational culture, values and ethics, understand the general aspects of their role and responsibility and orient themselves towards good workmanship. The program also provides inputs about organizational working and self-management, and helps reinforce the commitment of workmen on various aspects of quality, housekeeping, workplace-safety and self-development; thereby helping to create learning, development and commitment amongst the workmen. Continuous learning and development opportunities are given to the executives to hone their competencies and strengthen their leadership outlook. Equipping managers with knowledge, skills and attitudes required for effectively responding to the changing competitive pressures and opportunities. Helping executives broaden their outlook and strengthening their skills to face the challenges at higher positions by breaking the barriers of communication. Providing an opportunity to build contemporary thinking, exchange ideas and gain insights from a diverse range of peers, through creativity and decision making. Management Development has become very important in today's competitive environment. WWIL aligns management development with tactical planning, to be more competitive. The organization is committed with training budgets for management development and learning programs. A number of Management Development programs on subjects such as Personal effectiveness, Managerial Effectiveness, Leadership Development, Team Building, Supervisory Development, Communication Skills, etc., are conducted from time to time. Besides this regular programs to fulfill cross functional training need are also delivered regularly. These programs have helped the organization, to reinforce its vision, mission, ethics, values, strategies, capabilities, and helping individuals align with the organization. Our leaders are given exposure in the international environment. Senior Executives are nominated to attend the specialized wind energy courses at Danish University Wind Energy Training (DUWET) at Denmark. Besides this a good number of team members are also nominated to attend conference / seminars outside India to build international perspective on Wind Energy. The performance management process sets the foundation for rewarding excellence, potential development and ensures attainment of organization goals. WWIL nurtures a culture of performance through an effective performance management system, which encompasses activities like goal /KRA setting, continuous progress review, feedback and coaching for improved performance, implementation of employee development program and rewarding achievements. Performance management is a means for promoting superior performance by communicating expectations, defining roles within a required competence framework and establishing achievable benchmarks. Our online performance management systems based on 'S.M.A.R.T' performance objectives and standards, drive performance culture and robust performance.